This article is about the opera singer. For the doctor, see Elizabeth Connell (doctor). Frances Elizabeth Connell  (22 October 1946 –18 February 2012) was a South African-born operatic mezzo-soprano, and later soprano, whose career took place mainly in the United Kingdom and Australia. Connell was born in Port Elizabeth, South Africa in 1946, to an English Catholic father from Yorkshire and an Irish Protestant mother from Ulster,   one of five children. She read music at the University of the Witwatersrand, and after taking her degree, taught geography in secondary school. The University of the Witwatersrand, Johannesburg, is a multi-campus South African public research university situated in the northern areas of central Johannesburg. It is more commonly known as Wits University or Wits. The university has its roots in the mining industry, as do Johannesburg and the Witwatersrand in general. Founded in 1896 as the South African School of Mines in Kimberley, it is the third oldest South African university in continuous operation. Connell attained an opera scholarship to the London Opera Centre,  and came to the UK in 1970. Her teachers there included Otakar Kraus, who told her that 'one day you'll be a dramatic soprano'. In 1972, she was a winner of the Maggie Teyte prize for young musicians, and also made her professional debut at Wexford Festival Opera, as she was not able initially to appear in British opera houses,  as a white South African during the era of apartheid. She attained Irish citizenship via her grandfather. She read music at the University of the Witwatersrand, and after taking her degree, taught geography in secondary school. At the invitation of Edward Downes, she sang at the opening of the Sydney Opera House in Prokofiev's War and Peace in 1973, as Princess Marya, and continued to have a special relationship with Opera Australia for the rest of her career. 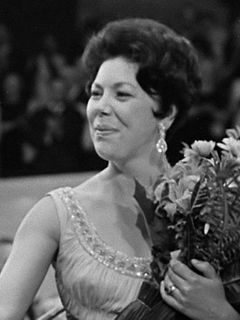 Her UK career attained greater prominence after her appearance at the 1975 First Night of The Proms in Mahler's Symphony No 8. She then had a regular five-year association with English National Opera. The London Opera Centre, a school for the training of opera singers and other opera professionals, existed in England between 1963 and 1977. It was located in the former Troxy Cinema on Commercial Road in London's East End Borough of Stepney. The Troxy, with 3,520 seats, opened in 1933 and was one of England's largest cinemas. As a result of wartime damage and the general decline of the area, the cinema closed in November 1960. Otakar Kraus was a Czech, operatic baritone and teacher. Luigi Cherubini was an Italian Classical and pre-Romantic composer. His most significant compositions are operas and sacred music. Beethoven regarded Cherubini as the greatest of his contemporaries. Anacréon, ou L'amour fugitif is an opera-ballet in two acts by Luigi Cherubini with a French libretto by C. R. Mendouze. It was premiered on 4 October 1803 by the Paris Opéra at the Salle Montansier. The choreography was by Pierre-Gabriel Gardel. The work proved to be a complete failure, ending its run on 1 January 1804 after only seven performances. The subject matter, a love affair of the Ancient Greek poet Anacreon, was completely alien to the spirit of the time. One critic complained that in his protagonist Cherubini had represented "un vieux debauché déguisé en héros d'opéra". Her many recordings include Rossini's Guglielmo Tell (Decca, Riccardo Chailly), Mahler's Eighth Symphony (EMI, Klaus Tennstedt), Mendelssohn's Second Symphony (DG, Claudio Abbado), Franz Schreker's Die Gezeichneten (Decca, Lothar Zagrosek), Gaetano Donizetti's Poliuto (NuovaEra, Jan Latham-Koenig, Live Opera di Roma), Giuseppe Verdi's I due Foscari (Philips, Lamberto Gardelli), Schoenberg's Gurre-Lieder (Denon, Eliahu Inbal), Richard Wagner's Tristan und Isolde (Squires Productions, Eve Queler, Carnegie Hall Live 1997) and Schubert Lieder with Graham Johnson, as part of Hyperion Records Complete Schubert Edition. Riccardo Chailly, is an Italian conductor. He started his career as an opera conductor and gradually extended his repertoire to encompass symphonic music. In 2008, two important CD releases were added to her discography: Her first operatic recital, singing great scenes by Wagner and Strauss for ABC Classics, conducted by Muhai Tang, and Benjamin Britten's Owen Wingrave , conducted by Richard Hickox. Elizabeth Connell also recorded portions of Sir Granville Bantock's "The Song of Songs" under the baton of Vernon Handley, for Hyperion. Dame Janet Abbott Baker is an English mezzo-soprano best known as an opera, concert, and lieder singer. The Gramophone Classical Music Awards, launched in 1977, are one of the most significant honours bestowed on recordings in the classical record industry. They are often viewed as equivalent to or surpassing the American Grammy award, and referred to as the Oscars for classical music. They are widely regarded as the most influential and prestigious classical music awards in the world. Karita Marjatta Mattila is a Finnish operatic soprano. Elisabeth Sara “Elly” Ameling is a Dutch soprano who was particularly known internationally for lieder recitals and for singing works by Johann Sebastian Bach. Performing with notable pianists and ensembles around the globe, she was awarded honours and recording prizes. Ann Murray, is an Irish mezzo-soprano. Violeta Urmana is Lithuanian opera singer who has sung leading mezzo-soprano and soprano roles in the opera houses of Europe and North America. Dorothea Röschmann is a German opera soprano from Flensburg. Lauris Margaret Elms AM OBE is an Australian contralto, renowned in opera and lieder. Bernadette Eileen Cullen is an Australian Dramatic Mezzo-soprano who has encomposed all the great leading operatic mezzo roles and concert repertoire in Australia and throughout Europe and Asia. Hermine Haselböck is an Austrian mezzo-soprano in opera, concert and lied. Katarina Esmé Marie Karnéus is a Swedish mezzo-soprano opera singer, winner of the BBC Cardiff Singer of the World competition, active on many of the opera world's major stages such as the Metropolitan Opera and the Paris Opera, and named Hovsångerska by the King of Sweden in 2018. Petra Lang is a German opera singer. Beginning as a mezzo-soprano, from 2012 a soprano, she is known for her interpretation of music by Richard Wagner and Gustav Mahler. 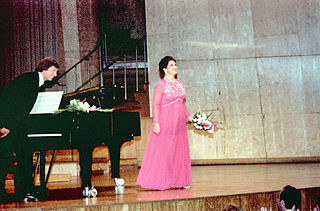 She made an international career in both opera and concert. She has performed at the Bayreuth Festival from 2005, singing the title role of Isolde in 2016. 1 2 3 4 5 "Elizabeth Connell". The Australian. 2012-02-28. Retrieved 2015-08-12. 1 2 3 Elizabeth Forbes (2012-02-27). "Elizabeth Connell: Mezzo and soprano acclaimed for her Verdi and Wagner interpretations". The Independent. Retrieved 2015-08-12. 1 2 3 4 5 "Elizabeth Connell". Telegraph. 2012-02-20. Retrieved 2015-08-12. 1 2 Barry Millington (2012-02-19). "Elizabeth Connell obituary". The Guardian. Retrieved 2015-08-12.